When A Bullet Misses Its Target, It Can Still Kill In places where bullets fly regularly, there's a new kind of "duck and cover" lesson for kids. The impact of stray bullets isn't widely studied, but their indiscriminate nature is known all too well. 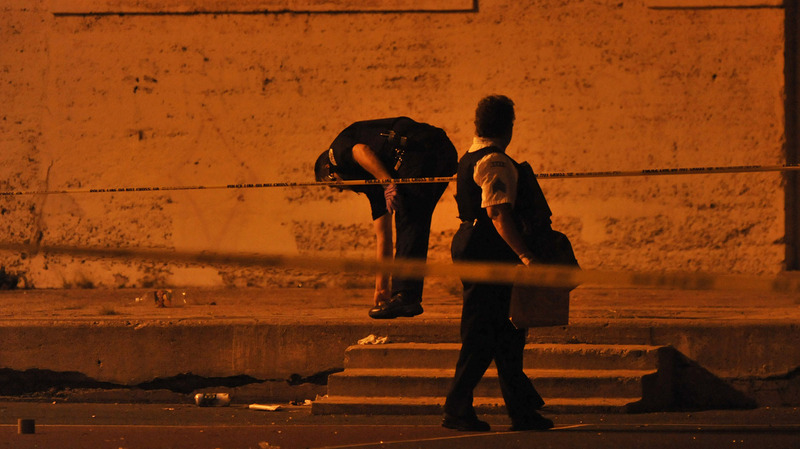 Chicago police detectives investigate the scene where a number of people, including a 3-year-old child, were shot in a city park in Chicago in 2013. In May, multiple people were struck or even killed by stray bullets in cities across the country, including Sacramento, Calif., and Des Moines, Iowa. In Washington, D.C., a 6-year-old is recovering from getting shot on a playground. Thursday, Betty Howard, a 58-year-old special education teacher, was talking with friends inside a real-estate office in Chicago's South Side when she was killed by a stray bullet. While stray bullets affect lives nationwide, there's little research about their prevalence and whom they affect. Nevertheless, some communities have made protection from stray bullets a childhood lesson. Mother Jennifer Groebe has lived the nightmare. Seven years ago, her 10-year-old son, Chris Rodriguez, was struck by a stray bullet from a robbery across the street from where he was having a piano lesson. Groebe was waiting in her car when the shooting happened and was nearly hit herself. "I thought rocks went through the rear passenger seat window on the left and then out through the right," Groebe tells NPR's Arun Rath. After the bullets ripped through her car, she ran to check on her son. "Chris was sitting there, and the teacher was frozen. The kids were a little disturbed, and Chris said, 'I can't feel my legs! I don't want to be paralyzed,' " Groebe says. Chris was in the hospital for two months and is now paralyzed. He uses a wheelchair and suffers from chronic pain because of nerve damage. Groebe says her son is still trying to have a normal life. He's a junior in high school, plays wheelchair basketball and is getting ready to go to college. But he lives with the physical pain of the shooting every day. Chris' story caught the attention of Dr. Garen Wintemute, an emergency room doctor at the University of California, Davis. Wintemute wanted to know more about the extent of this problem as a health risk. He was surprised to find there were not any studies. He started his own, which he published in 2012, but there is still little research on the issue. There are still not enough data to say how frequently these shootings occur, but Wintemute was able to analyze more than 300 cases that covered a one-year time frame. Violence is often thought of as disproportionately affecting young men, and accurately so, Wintemute says. The victims of stray bullets, however, are incidental to that violence and tend to be proportionate with the general population. He found that more than 30 percent of the victims of stray bullet shootings are children, like Chris, younger than 14. Males and females were affected about equally. "[It's] not the age group that we're used to thinking about, not the gender that we're used to thinking about when we think about violence," he says. Wintemute says about 41 percent of stray-bullet victims were in their homes, often indoors and sometimes even asleep in bed. He says 60 percent of the incidents occurred as a byproduct of intentional gunfire. Other causes included hunting and celebratory gunfire (bullets returning to the ground after being shot into the air). In some communities, gunfire is a part of daily and nightly life. Some schools even conduct "duck and cover" drills like the ones conducted when the threat was missiles from the Soviet Union. "Now the concern is missiles from down the block," Wintemute says. "Fear of random violence impacts daily life in entire communities." Marsha Lee of Chicago lost her son to gun violence in 2008; he was killed when he tried to stop a robbery. Today, she worries about three young girls she helps care for. The little girls are 6, 7 and 9 years old, and these days she finds she has to talk to them about what can happen when bullets fly, the way kids have been taught to "stop, drop and roll" if on fire or to not talk to strangers. Lee says things have changed. "Now, I have the added burden of trying to teach them how to protect themselves, hopefully, in case of stray bullets," Lee says. She says she teaches the girls to get down low to the ground and to stay there until it's over. She tells them to check on themselves and those around them once the bullets stop flying. Lee now works for an organization that seeks to prevent gun violence, Purpose Over Pain. She worries constantly about the girls. "When you have children at the age that I'm talking about," she says, "they're nothing but innocent bystanders."